Being a Mariners fan, I’ve had a crush on Paxton for a couple years now. What’s not to like? He’s a tall (6’4″) well-built (220 lbs.) power lefty that touches 99mph regularly with a seemingly free-and-easy delivery. He’s also adjusted to a new arm slot he picked up in AAA last year that’s closer to a 3/4 release than his previous over-the-top method of delivery. This change in arm slot added both velocity as well as new movement to his existing pitch types and it’s been giving hitters fits. In short, what I’m trying to say is, if you aren’t already infatuated with at least the potential of Paxton’s 2017, I’m here to fix that. Just to preface – don’t expect me to go crazy in-depth here with numbers and stats. This is going to be a much more relaxed approach of showcasing the “stuff” that Paxton’s bringing to the table this year. What I want from you is to just sit back, get comfortable wherever you are, relax, and enjoy the sight of what this Canadian lefty can do to major league hitters. I’ll start us out nice and slow. Just some nice “free-and-easy” 96mph heat on the inside black to a RHB for the called strike three. I’d also like to point out that the hitter, Taylor Motter, dropped his bat and began to take off his batting gloves despite only being the second out of the inning. Clearly rattled after getting embarrassed by Paxton. Let’s take it up a notch. This time we see some sweet lefty on lefty action as James pumps a sick 98mph Fastball right through the swinging bat of Justin Morneau. Unless my eyes deceive me, this one looks like it brings a hint of cutting action as well. Brutal for a LHB to try to connect with at 98mph. Nothing too crazy in this next one. Paxton rears back in a 1-1 count and delivers some 98mph cheese right down the heart of the plate to Andrew McCutchen for the whiff. This final standalone Fastball is worth pointing out for the fact that it’s a pitch Pax has started to use often. After getting David Freese 0-2, James lets it fly with a ladder-climbing 98mph heater that earned a strikeout. Notice the inning as well as the pitch count. This is his ninth pitch of the outing and he’s bringing the velocity like it’s nothing. He’s been using this same Fastball (up and in to RHB) as a purpose pitch quite a bit. He likes to hit this spot or miss slightly up or in to setup a Knuckle Curve that will bounce in front of home and have hitters chasing regularly (you’ll see a good example of this later on). Here we can really see just how much horizontal movement Paxton is now getting from his Cutter thanks to the newfound 3/4 arm slot. Batters like Steve Pearce have to prepare for 98mph Fastballs but instead get an 88mph cut-piece like this one that just keeps barreling in on their hands. Just another easy whiff for Paxton’s new favorite weapon. Would I be helping my case for Paxton’s potential if I showed you he could paint the inside corner on a LHB with the same Cutter? Yes? Ok. Jaff Decker thought it best to get out of the way of a pitch that appears to be headed for his hip, when this 89mph Cutter slid right over the black for a second strike. So good. Tim Anderson thought he was safe from the Cutter in his fresh 0-0 count but boy was he wrong. I love it when a catcher flashes a target and the pitcher nails it perfectly. 89mph beauty for a whiff and a first pitch strike. So we’ve seen the horizontal cutting action. It’s wonderful. It gets whiffs like nobody’s business. But I’m here to make you fall in love. What if I told you Paxton can also get vertical action with the Cutter? Crazy, I know, but hear me out. Some people still aren’t comfortable with calling James’ Cutter a Cutter because of how much it replicates a typical Slider. Scott Servais (manager of the Mariners) has even referred to it as a Slider at times. Paxton himself calls it a Cutter though and I think we should take the man’s word for it. 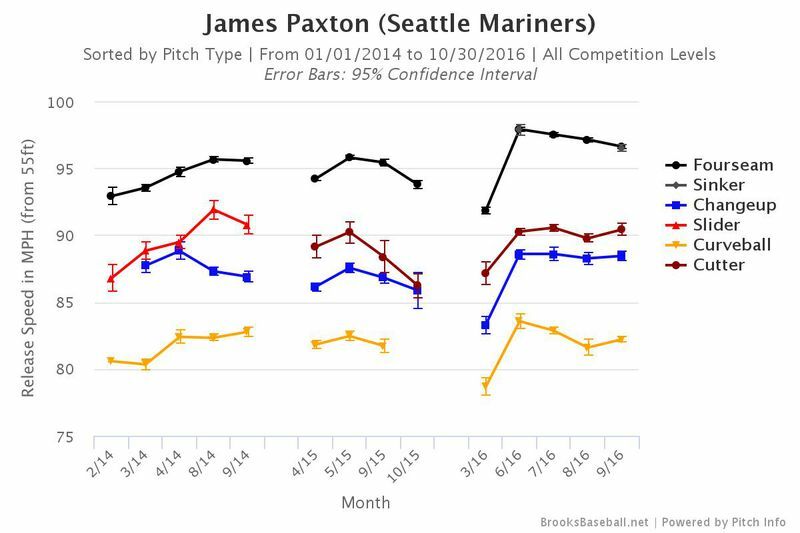 We’ve seen the variance in movement types among Sliders in the league, and Paxton’s Cutter is no different. Watch here as, again, in an 0-0 count, Paxton abuses Adam Eaton with an 89mph Cutter that simply falls off the table for the whiff. Just gross. Paxton’s breaking ball is the slowest of his four main offerings – registering in at 82mph on average. It’s a nasty hook that offers a great mixing to the rest of his repertoire. We’ll start things off with this dandy of a 2-2 pitch to Brian Dozier that sneaks back over the plate and under the bat for the swinging strike three. That innocent little pat of the glove you see James give is about as animated as he’ll ever get on a diamond. Adorable. As you can probably imagine, the Knuckle Curve can be devastating on LHBs. Everything apart from the breaker comes in at 88mph or above. When you’re trying to sync up your timing with the Fastball, you can be made to look like a fool if James brings you the hook. This is exactly what happened in back-to-back offerings to Logan Shafer. Just watch how early Shafer is opening up his hips on these pitches. He’s giving up his lower half in preparation for the Fastball, resulting in half-assed swings and an easy pair of whiffs. You ready for some slo-mo action? Because I could watch Kennys Vargas swing through this nasty 82mph Curve all day. Once again, don’t forget to watch the hips/front leg of Vargas open up way too early. Take your time. I’ll be waiting. And finally, perhaps one of the worst swing attempts I saw at a James Paxton Knuckle Curve. I give you Jung Ho Kang‘s futile flail at this 2-2 83mph breaking ball for the whiff and punch out. Now there’s a lower half to keep an eye on. My goodness. 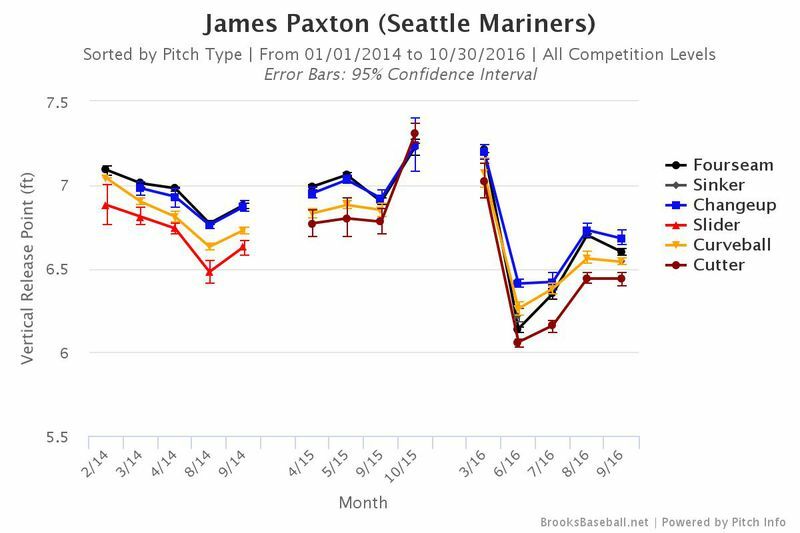 Despite only throwing the Changeup a total of around 8% of the time in 2016, Paxton’s fourth offering packs a punch. It’s obvious from some of the swings you’re about to see that the Changeup is the last thing on a hitters mind when facing our big hunk of Lefty. First there’s Mikie Mahtook, who was simply trying to protect in a 2-2 count and noticed something round heading towards the strikezone. He then starts his swing and before he knows it the 89mph Change is in the dirt and he’s struck out. Then there’s this regretful half-hack from Avisail Garcia on an 88mph Changeup that continues to drift away from the RHB. Paxton didn’t even have to come close to his target and he’s still chalking up another whiff. Almost the exact same pitch as we just saw, Paxton catches Todd Frazier in ‘swing mode’ (is Frazier ever not in swing mode?) and completely embarrasses the righty with an ugly swing and a miss on a sweet 89mph Change off the plate. Something I’m going to be adding to these GIF Breakdowns once the season gets rolling is this bonus ‘Sequencing’ section towards the bottom. It’s just fun for me to watch a full AB in one GIF and see the entire approach a pitcher takes against a hitter in the matter of 15 seconds or so. I would imagine you feel the same way. So let’s give it a go! First up is Byron Buxton. James uses a sweet looping 80mph Knuckle Curve to get ahead 0-1. He then paints some 96mph gas right smack dab on the outside corner at the knees accompanied with some sink/tailing action – this pitch is absolutely filthy. Perfect execution. Imagine what’s going through the mind of Buxton at this point. Why not bounce another Curve thrown in the same direction as that perfect Fastball while you’re ahead 0-2? Love it. Todd Frazier sure got a ton of mileage in this write-up. Paxton made quick work of the veteran righty in this 3 pitch sequence that resulted in a swinging strikeout. First the easy 98mph Fastball that’s located brilliantly right at the knees, then the 89mph Changeup we saw earlier that welcomed an ugly swing, and another Cutter that bounces in front of home plate – this time at 91mph and good for yet another whiff. This third sequencing GIF showcases exactly how deadly a solid Fastball/Cutter combo can be when your name is James Paxton. He starts Frazier off by burying some 96mph heat right on his hands. Todd’s lucky to have gotten a piece. Next he hurls an 87mph Cutter in the exact same location as the Fastball he just threw. Seriously, look at the graphic in the bottom right. How perfect is that spot for a follow-up Cutter?! Brilliant. Beautiful. Now you’ve got the free-swinging Frazier 0-2 and could basically take your pic of how you want to dispatch him. Let’s see… how does 97mph up out of the zone sound? Another hitter leaving the box frustrated and yelling obscenities at themselves. I’ve watched this one so many times already. Be mine, James. Something that stood out to me when first jumping into this piece was the fluctuation in pitch usage throughout 2016. Specifically Paxton’s usage with everyone’s favorite offering – his Cutter. Throughout his first 14 starts last year, James was averaging over 20 Cutters thrown per game. In his final 6 starts however, he totaled just 23 Cutters (average of 3.8). Rather than speculating on what was wrong or why he abandoned it in favor of the Knuckle Curve down the stretch, we reached out to Paxton on Twitter and he was nice enough to respond. There was also an issue with a torn fingernail that limited his pitch selection. Bottom line is, he took the opportunity to work on his other stuff (his Knuckle Curve specifically) in anticipation for his future. Knowing he’d like to get more even with his mix of Curves and Cutters is pretty exciting. As I prefaced up top, I’m keeping it light here in terms of stats and advanced metrics. I just wanted to pass along some visual aids to help you and your imagination run wild at the thought of what Paxton’s true ceiling could be. We all know about the injury history (never topped 121 innings in the majors) and as Nick mentions in his rankings, Pax got stuck with a 66.3% LOB and a .347 BABIP last year. The innings will have to increase dramatically for Paxton to truly shine, but you won’t want to be the one who waited one year too long to jump on board. As is custom in our GIF Breakdowns, I’m gonna leave you with something special as the final GIF. Paxton threw four pitches in this duel against Avisail Garcia that would lead to a strikeout. He also happened to throw each of the four pitches highlighted in this article. You’re just too good to me James. Valentine’s Day just wouldn’t be the same without you. Watch as Paxton starts off dotting a ‘get-me-over’ 82mph Knuckle Curve on the outside black for the called first strike. He then pulls the string on Garcia with a gorgeous 88mph Changeup. You can actually pinpoint the moment Garcia regrets swinging – it’s perfect. With an 0-2 count, Paxton uses his purpose pitch (referenced in the Fastball section) in the form of a 98mph heater in off the plate. Paxton couldn’t care less that it missed the zone. This is simply a reminder for Avisail that this is still an option for James to throw. Now that the Fastball is fresh in his memory, Paxton demoralizes Garcia with his glorious vertical Cutter that hums to the plate to the tune of 89mph. Take a seat, buddy. I love seeing hitters mumbling to themselves as they walk back to the dugout. After going through these GIFs, it’s hard not join me in my infatuation with James Paxton and get excited for the year ahead. Happy Valentine’s Day, you magnificent southpaw.